New York City is a few cities in one, with Manhattan being one of the boroughs to live in. Dating someone within your borough has a lot of advantages. Keep in mind that although you’re living in New York City, the whole culture is different in Manhattan than it is in the Bronx. Where you live is a choice and also a testament to how much money you make. So if you live in Manhattan, the singles in Manhattan are fundamentally similar to you in many ways. Dating within your borough means you can add a little fun to the date/personal interview you’re about to encounter. Keeping in mind that the Manhattan residents tend to be high-powered, wealthy, and disciplined, where you go on a date is pretty important. For the Upper East Side self-made millionaire, they want to be seen in an exclusive bar. There are plenty of places to be seen in Manhattan and they are ever changing. 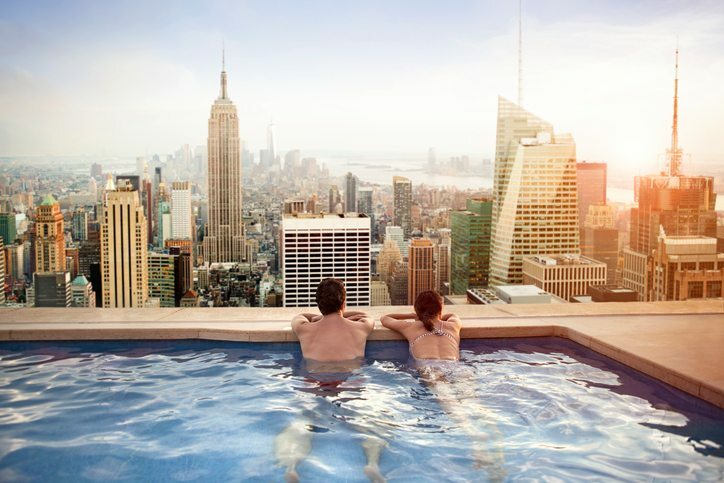 Especially during the good weather months, rooftops in NYC are the place to be. The ambiance is usually perfect for a date. In Midtown East, you can go upstairs at the Kimberly Hotel to take in the night. Here, you can take in the cityscape while getting to know someone. If there is a potential for sparks to fly, it will be here. Cocktails are pricey, naturally, but the bartenders make them strong and create infusions that you and your date can relish over. Meanwhile, on the Lower East Side at Hotel Chantelle, you can find a quiet spot from the constant flow of traffic below. It sits between the main area between Stanton and Rivington, a perfect oasis in a central spot. The space is three levels and if you’re looking to impress your date, this would be the place to bring them. If you go early enough, you can get a burst of sun and sip on cocktails. Their signature Sangria is made with special fruit and Pyrat rum. Once the night kicks in and you’re ready, you can go downstairs to the basement of the hotel to dance. The High Line is a popular place to take a date. It was originally an above-ground railroad but has recently been converted to what New Yorkers describe as urban bliss. There are art installations that decorate the walkways and there are also trees. The park is elevated so it’s more peaceful. You can eat artisan popsicles while walking down the streets from La Newyorkina. If you just want to get to know one another first, this is a quiet tranquil place to go for a walk with little distraction. If you’re really feeling the potential between you and your date, rowing across the lake is a way to nurture the connection. It is beautiful and tranquil and will impress the ladies. It might be a bit corny but you’re following courting traditions of New York from generations before you. There’s got to be some merit in that. You can eat at the Boathouse after for a decadent white-tablecloth meal and take in the views. There’s a casual grill outside that will cost you less money with the same view. Lunch at the Boat Basin has a beautiful view of the Hudson River. The food is mostly a burger affair but they do have a frozen piña colada that is pretty epic. You can walk down West 72nd Street afterward to Pier 72. There are free kayaks for rent there, care of Bloomberg. There’s even a free kayaking class to teach you how to kayak. There is tandem paddling so you can get an inkling of how well you work with your date as a team. The sunset at the Hudson River is not to be missed either. It’s best viewed at Casellula on 401 West 52nd Street. There’s a great cheese and wine selection here. Whether you’re looking for adventure or just a drink, Manhattan offers a gauntlet of places that will enhance the date you’re on.